As North America transitions from fossil fuels to renewable energy sources, more and more people will be switching from Natural Gas furnaces to electric heating. How might this transition take place? Some good souls may do it out of the good of their heart, but for most people, it will have to be economically incentivized as well. Here are some tips so you can start saving on heating costs in BC. In British Columbia, both Fortis BC and BC Hydro have a two-tiered electricity structure, which means you pay a higher price per unit of electricity if you use more. In principle, this is a good idea as it encourages people to use less electricity, however, it does not encourage a transition away from fossil fuels such as heating oil or natural gas. Now we have the aim of switching to electric heating, but an electricity structure that incentivizes energy saving which sounds like we’re being caught between a rock and a hard place. The way out? Solar and air source heat pumps! Air source heat pumps are like a refrigerator trying to cool the outside. 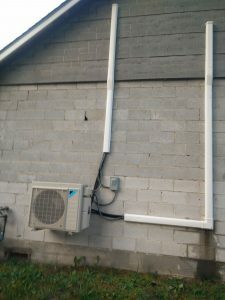 Depending on outdoor temperature, an air source heat pump will transfer 1.4 (at -25C) to 4 (at 20C) units of energy from outside to inside for every unit of electricity it consumes. The official term for heat pump performance is coefficient of performance (COP) which is essentially equal to efficiency divided by 100 so a coefficient of performance of 3 means it’s 300% efficient! Air source heat pumps are not a new technology for saving heating costs in BC, however, they are only used by 3.5% of households in BC while 30.5% use electric heaters (NRCan, 2015). BC Hydro and Fortis BC are partnering to offer an $800 rebate which brings the cost of an air source heat pump to about $8000 where the equivalent natural gas furnace would be $5000 (Pembina Institute, 2017). Whether or not this is a good investment financially depends on your specific situation including climate, house size and insulation, energy rates and local incentives. The other part of the solution which helps with saving on heating costs in BC is the integration of solar PV. For Nelson Hydro especially, the amount of energy self-consumed is not a critical metric because these utilities credit excess generation to your account and only pay you out once per year. This means that even though you will generate most of your electricity on warm summer days and consume most electricity on cold winter days, your summer electricity credit will reduce the higher power consumption charges in the winter such that (financially) it is as if you consumed the electricity directly. Fortis BC and BC Hydro are similar except that they have the two-tiered rate structure so you are more likely to reach the second tier in winter when solar is down and the air source heat pump is running. Whether or not this combination of technology is right for your application is dependent on a number of factors such as current consumption, local climate, electricity provider, and home design. Let us know if you’re interested and we can put together a quote for you!